Purpose: To take actions that improve your health and well-being. 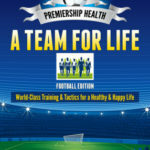 A Premiership Health team needs to have an effective strike-force if it is to succeed, and, as Manager, you need to develop a high class attacking unit, with players who possess clinical finishing skills, have great self-awareness and an eye for goal. The Action Attacker – a top class striker, always on the move, capable of making darting runs and finding the openings. This fella never stands still, keeping the opposition on their toes and helping to set-up so many goal-scoring opportunities. Their dynamism is incredible, a valuable asset to any team, creating the experiences that shape your life. If you stop to think about it, what actually makes the difference in your life and gets the results, are the actions you take. It’s all very well thinking that you must eat healthier or exercise more, but, when everything is said and done, you’ve actually got to go out and do it, JUST DO IT! Not many players are held in such high regard by their club, they have a statue erected in their honour outside the ground. Tony “Bomber” Brown, is such a player. He made a club record 720 appearances for West Brom, over an 18 year period and scored a record 279 goals. It is unlikely either will ever be surpassed. You also don’t score such goals without risking a few knocks and injuries along the way. The actions he took in his playing days came at a price later on in life, as Tony has needed three joint replacement operations to keep him mobile and active. You see, it is a fundamental law of nature – Newton’s 3rd to be precise, that for every action there is an equal and opposite reaction, and when you start kicking a ball around, you can expect it to come back at you just as hard. So, unless you take care with the actions you make, you can often end up on the injury list.